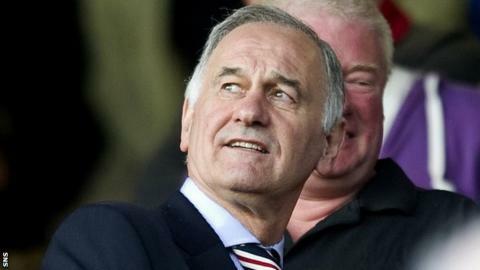 Rangers chief executive Charles Green claims "more than two" Scottish Premier League clubs have used employee benefits trusts. is the subject of an SPL investigation into payments to players. Green would "rather not say" which other clubs he was aware of that had used EBTs, but added: "I have put my hand up and they should do the same." The SPL will on Tuesday have an initial meeting of the commission to investigate the club's alleged use of dual contracts during the period EBTs were operated by the company that formerly ran Rangers. The league has more than a dozen sanctions, including stripping Rangers of league titles, at its disposal should it be decided that the club broke rules about side payments. SPL said in June Rangers had "a prima facie case to answer in respect of [league] rules"
However, no-one from Rangers will attend the meeting, with Green insisting on Monday that "neither the SPL, nor its commission, has any legal power or authority over the club because it is not in the SPL". And, speaking to BBC Radio Scotland's Good Morning Scotland programme, Green contended: "There is no-one to stand in front of them, this should have been done when the SPL had jurisdiction, and they didn't do it. "You are allowed to have an EBT, you have to disclose it, and of course there is a whole raft of information that when these EBTs were being used they were disclosed. "They were in the accounts, it's public knowledge, Rangers were a public company, you can go on the internet and see the disclosures." Rangers, who were relaunched by Green's consortium after the former incarnation could not be saved from liquidation, were placed in the Scottish Third Division after Green's bid to take over the SPL share previously owned by the club was rejected. And Green has suggested the Ibrox side may not seek re-entry to the top flight, should they be successful in progressing to and winning the First Division. "Unless the SPL welcome us with open arms why would we go back there," he added. "Ten clubs voted Rangers out of that league, what makes you think they would want Rangers back in. "It begs the question will the league still be there in three years' time."